It's been one of those weeks. We all had bouts of sickness, including Ruby who bled out her ear one night! Turned out to be a minor ear infection but still slightly disconcerting to find a sizeable patch of blood on her sheet! And then, I was left always on the back foot, never quite catching up. Hence my absence online, so apologies for the lack of posts, tweets, You The Expert and Moneywise Mondays! But I'm back today for You the Expert and that's the main thing! So, if you're not familiar with this linky then basically it's your chance to show off your expertise! There's no limit on the topic, just link up your tutorials, recipes or How-to Guides so we can all learn something new. 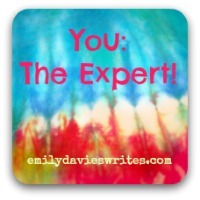 Tweet the link with #YouTheExpert to spread the word and be sure to comment on other people's. Don't forget I pin every entry, you can check out the board here. Right then, let's link up!